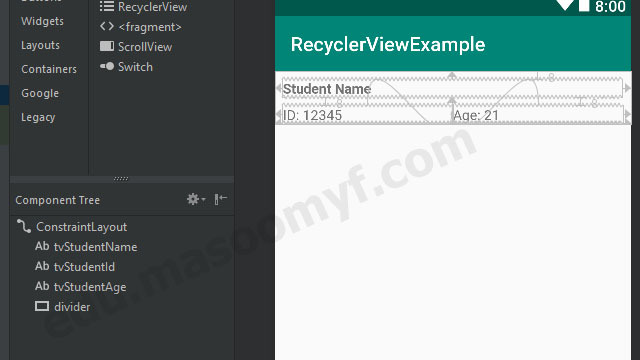 With lot of efforts and writing huge code for Android RecyclerView, I ended up with this code, but for now I think it is very easy to use and handle click listener. This implementation is different from any other implementation you see on many sites. Create a new project with Android Studio with empty Activity "MainActivity"
//We don't need any context field. We can get context from viewGroup. //set the itemView click listener. //It's look beautiful and become easy when we create bind method inside holder. 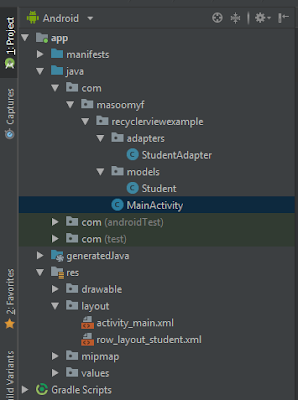 //Always set tag after binding, if there is already a tag in itemView, it get replaced. 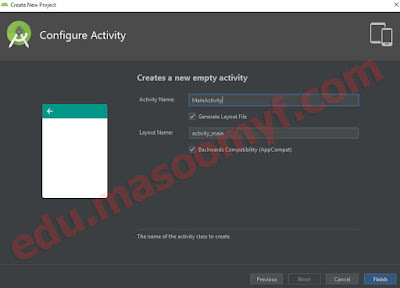 //This method will setup the whole UI, it's better to setup UI in seperate method. //We don't need to declare adapter variable in field. // We can get adapter through recycler view whenever we need. //Add some dummy data to list. //Get the Student object from itemView tag. Android - Creating a circle button widget with text inside. Android - New and easy way to handle findViewById.